WE ARE NOW DOWN TO OUR LAST SETS, ONCE THEY'RE GONE..... A 1200 page, hardbound three book set, chronicling every CD Book & Vinyl release by FTD from June 1999 to September 2016. A master piece of work from Keith Flynn & friends.... Elvis recordings specialist Keith Flynn has completed a masterpiece about the FTD label, a 1,200 pages, hardbound three book set, chronicling every release by FTD. 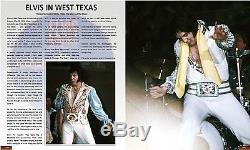 The book was authored and designed by Keith Flynn with input from a large number of other Elvis specialists including EIN's Piers Beagley, EM&HM's Trevor Cajiao, Geoffrey McDonnell, Gordon Minto and many others. The book also features 100s of high-quality photos from the collection Erik Lorentzen. KJ Consulting are proud to publish this Box Set which weighs 8 kilos. 1 The books have an index (in the front of the books) which lists all FTD releases as they were released and with page numbers where to find them. 2 Cover-art is almost full page, both front and back are seen and when re-pressings are different they are shown too. 3 Written out track-listings have sometimes little additional info which makes it more clear what a certain track is (unrepaired, undubbed, overdubbed, repaired etc etc). 4 Notes have been made about all FTD's about certain tracks, but also to correct wrong dates, take numbers etc etc. So far, after going through these 3 books for about 6-8 hours already, i've found just 2 small mistakes in those notes and although that's unfortunate it doesn't bother me too much. This is a 1200 page project, so it's never going to be 100% accurate. 5 Every FTD is accompanied by, mostly, long and very detailed reviews by people who know what they are writing about and although some people think all reviews are on the web already this isn't the case. Quite a few reviews were written exclusively for this 3 book set. Many pictures are known, but (in my opinion) are printed here in the best quality yet. Pictures are mostly half or full page and are never intrusive or get overwhelming. It's a plus that they always are taken around the time-period (or even specific dates) the FTD they accompany covers and therefore never feel out of place. There are, at least for me, still some never before seen pictures in the books too. 7 The lay-out is excellent. As said before, pictures are never intrusive, overwhelming and/or distracting. The text is 100% readable and the overall lay-out is much, much more clean and enjoyable than its big brother'Ultimate Elvis' or any'Elvis Files' book for that matter. I have probably forgotten a lot of things, but this should be enough for people who still not have decided to order (or not) this set. Keith, Piers, Erik and everyone who contributed to this project have done a really fantastic job. It's a labor of love and it shows. Also to illustrate why it is fun to revisit the reviews: I only had listened to the August 22nd 1969 dinner show ('In Person' FTD - CD 2) for a couple of times, but often I find that I'm listening but not really'hearing' it if you know what I mean. When I was reading the excellent detailed review on this FTD my eye caught a piece about a'conversation' Elvis had mid-song with Mrs. I had never noticed that, put on my headphones and started listening and only then I heard the conversation. That's the power of a good written review. Furthermore I realized that this must have been the first time in about 15 year Elvis saw the Tippler's and still when she asked mid-song if he remembered her he actually did. I can't wait to find other gems like this in the reviews, or listen to the small nuances between takes in the studio when reading about them in the reviews. 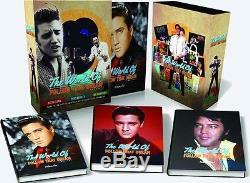 The item "Elvis Presley The World Of'Follow That Dream 3 Book Set New & Sealed LAST SETS" is in sale since Monday, February 4, 2019. This item is in the category "Books, Comics & Magazines\Collections & Lots\Books". The seller is "circleg-ep" and is located in Clacton-on-Sea.